Gunilla Björkvall, Olle Ferm, Mia Åkestam (eds. 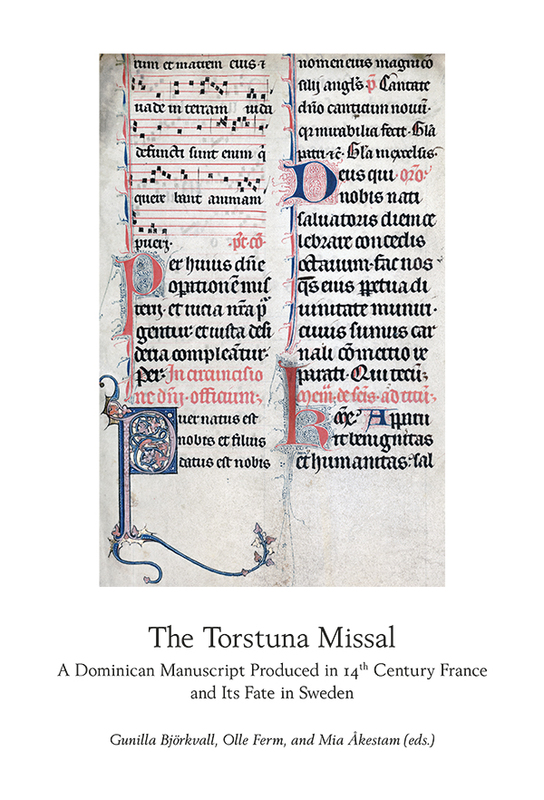 ), The Torstuna Missal. A Dominican Manuscript Produced in 14th Century France and Its Fate in Sweden (2017, 246 pp). ISBN 978-91-88568-69-4. A Dominican missal, a magnificent exemplar, was ordered by someone, unknown but decidedly well-heeled, to be created in Paris in the first half of the fourteenth century, probably in the 1320s or 1330s. Its commission was likely entrusted to one of the famous scribal booths on the city’s Left Bank. The missal was later transferred to Sweden. In effect, that is all we know about the origin of the missal. Its history in Sweden has long been established; it belonged to Torstuna, a parish church southwest of Uppsala – although no one has been able to show how it got there. Different aspects of the missal, its design and composition, its fate and field of application in medieval Sweden, are addressed in this book. Included is a facsimile of the surviving manuscripts, with a transcription. It is moreover suggested that the missal’s destination was Uppsala Cathedral, not the church of Torstuna. A CD with performances of a selection of the missal’s chants has been produced.